Rockstar has struggled with the launch of GTA Online and hopes some in-game cash will smooth over any lingering frustration. Character deletion, infinite loading, network errors, and getting stuck in areas are just a handful of the problems in Rockstar's Grand Theft Auto Online. Starting sometime next week Rockstar will deposit half a million in-game cash to each GTA Online player. 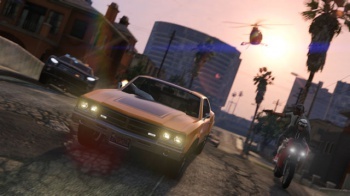 "For players who experienced cloud server errors, connection issues, and lost game progress and characters in these first days of GTA Online, we hope this GTA$ helps to facilitate a fresh start or makes your continued life in Los Santos and Blaine County extra sweet," Rockstar stated. Anyone who has played GTA Online at any time in October qualifies for the deposit, which will come in two $250,000 deposits by Rockstar into players' GTA Online bank accounts. First players must install a GTA V title update, expected to be live next week. The update is supposed to fix issues of vehicle purchase loss, and it will enable Rockstar to provide the in-game cash to each player. Rockstar stated it remains committed to release fixes to the game and asked all players to visit the Support site. Lost characters or rank will not be restored. "We sincerely hope that this cash stimulus we're giving out this month will help you get back on your feet," Rockstar stated in a comment. The company added that upcoming content such as heists are "indeed in the works."